When you choose to build with Wolf Construction, you are guaranteed quality construction. 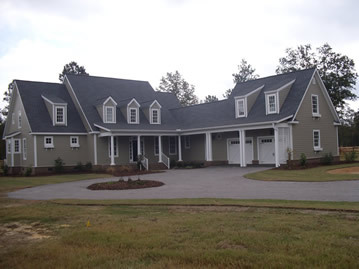 We are a local custom home builder in Aiken, SC, and we pride ourselves on our ability to provide design assistance and build your home or commercial building with custom details to satisfy the most discerning customer. We realize that a significant amount of time and effort goes into building, from deciding to build, lot selection, floor plan design, interior selection process to the final walk-through. Our strict attention to detail for each facet and on site supervision throughout the building process ensure quality construction and customer satisfaction. We have built our reputation in the Aiken area by satisfying our customers and delivering those special features. Because we also believe that an educated client is a satisfied client, we will strive to keep you thoroughly informed throughout the building process. To this end, it is vital we meet with our clients on a regular basis to ensure your complete satisfaction. The positive relationships that we develop during this process will last long after the home or commercial building is completed. Clients choose us because we are an established local Aiken contractor known for solid construction and an authentic commitment to customer satisfaction. Contact us about your next project.